Who would’ve thought Middle East peace could be so complicated? An announcement about President Donald Trump’s Middle East peace proposal has been indefinitely postponed after he discovered that Israel already has a wall. Eventually, Trump settled on just “WALL”, which it took him 143 minutes to write without making a mistake. “I think the reporting done so far has already shed light on the fact there was a lot of work done to put together this proposal,” said White House chief strategist Steve Bannon, who is travelling with the President as he heads to the Vatican today. Trump was preparing to present the proposal this morning before flying to Rome, but was blindsided when he discovered that the Jewish state of Israel already has a wall, surrounding both the West Bank and Gaza. “What’s this?” Trump asked Prime Minister Benjamin Netanyahu, shortly before the scheduled announcement. He pointed to a section of the West Bank wall. Reporters close to the scene said Trump appeared distant following that exchange, and instead of listening to the Prime Minister, just stared into space for the next hour or so. I have always said peace in the Middle East will not be easy. It will not be easy, by no means. In this part of the world, it takes a lot to win, believe you me. 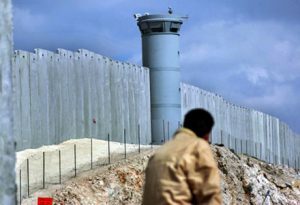 It is in spite of the big, beautiful wall that Israel has built – perhaps I wouldn’t say beautiful, I have heard some people say, even, that it is, at best, a second rate wall – but a tremendous wall nonetheless. It is in spite of this, that there continues to be bloodshed in this part of the world, and perhaps, as we have learned from history, this wall is not high enough. If there is ever to be peace between Israel and the other one, it will take much work, and many pages, so many pages, probably more than two. The printing, I mean, the cost is unimaginable. It is my hope that I will be able to achieve this – deals, it’s what I do – and I will be thinking very hard to have an idea, an idea for everyone. In just the last few hours, it is reported the President has found “new hope” for peace, after learning that Palestine does not have a wall.